It has been a crazy hot summer! So many days with temperatures over 100 degrees F! I love the summer, and the hot hot weather, but one problem I encounter summer after summer is I never feel like sitting down to eat a full meal. I’d much rather snack. After all snacking doesn’t require slaving over a hot grill or heating the whole house up cooking dinner. All day snacking isn’t ideal for a family. This weekend I figured out something that is light and easy, AND doesn’t require heating up the entire house. In fact, you can sit down and eat in about 15 minutes after you started cooking. You could serve these as is for a quick pool side appetizer or along side fried rice for a complete meal. 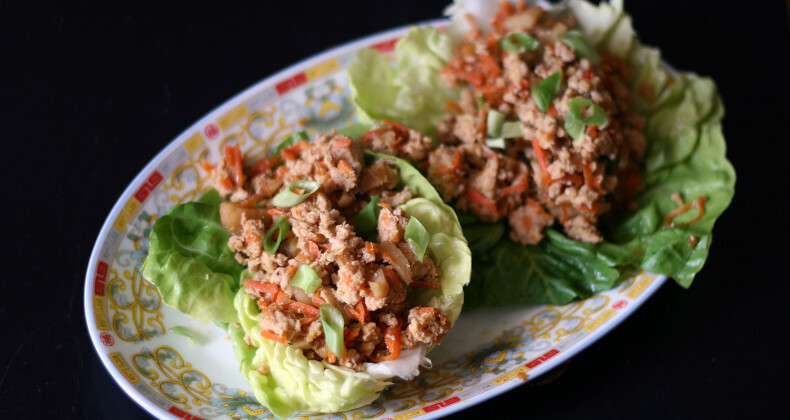 If you want more oomph you could put a scoop of rice in your lettuce then top with the turkey mixture. Using a food processor with the shredding disk, shred your carrots, onion, ginger, and garlic. In a sautÃ© pan over medium-medium high heat heat oil. Add in shredded veggies and sautÃ© for 2-3 minutes. Add in ground turkey, making sure to break it apart with a wooden spoon. Cook until turkey in no longer pink and veggies are soft, 6-8 minutes. Separate lettuce leaves, making sure to leave them whole. Rinse and dry them. Set aside. Once turkey is cooked, add soy sauce and fish sauce. Stir to incorporate. Stir in chopped scallions. Turn off the heat and get ready to eat! Serve a scoop of the turkey mixture in a whole lettuce leaf. Wrap the leaf around the meat mixture and eat like a taco. Enjoy!